I nearly stood there holding the paper up high to proclaim my utter contempt at the headline. My habit when entering a supermarket is to first, after getting the obligatory metal basket or trolley, to stop at the square news-stand, reading the headlines as I proceed around. About two weeks ago I glanced the headline in the Murdoch Sun that said “Gazza is dying as we watch”; my god they are finally printing some real news for once, then I realised that they were not talking about the plight of the Palestinians in the occupied territories but the last chance saloon for the legendary blubbering alcoholic Newcastle footballer. So much for real news! In fact it wasn’t even headline that really got to me, other than the clear leading implication that this was a good thing. No, it was the sub heading that went on to say that the value of houses was rising and leading the economy out of the great recession. So there I was in the entrance to Tesco and about to say what I will say here instead. No, it is not house values that are increasing it is the price that you the punter is expected to pay. 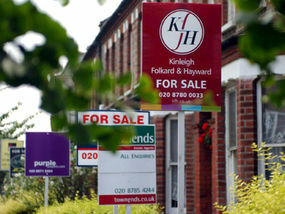 House prices are increasing, that is true, at least in the South-east, but not the value. Value and price, particularly with regard to property are clean different things. You may say with honesty that more banks are once again willing to lend but you can’t say that in such an economy that these properties are actually worth any more than they were worth last week or last month or that it is a good thing. No, again, strange as it may seem for a government so ideologically opposed to Keynesian Stimulus and market manipulation, that they are doing exactly that; using the governments ‘Funding For Lending Scheme and quantitative easing to pour money into cheap loans for unaffordable properties. The difference between mushrooms and houses is that most people have little financial interest in the world of mushrooms whereas most people do have an interest in the world of mortgagees and houses. If you are a home owner, or more often, a mortgaged owner then at the moment you may feel reasonably pleased. Interest payments are at an all time low and, if the Daily Express is to be believed, the value of your home is rising. This gives you a warm and comfortable feeling, maybe I ‘can’ draw out some equity, and maybe I ‘can’ afford those two weeks in the sun or ‘that’ new car. If you’re a saver, you may feel just be a little different, your interest has been at an all time low and even long term investments are hardly keeping up with inflation. Ditto with young people. If you’re saving for your first property, things have not been a bag of laughs for you either. During the first phase of the housing crash, it was almost impossible to get a mortgage without a large deposit. This situation has got somewhat better as of late and I suspect that this is the real reason why house prices are moving upwards again. The only problem is that in some respects we are back to the situation ‘pre crash’ where banks were lending on very small deposits for houses that were way beyond traditional price ratios compared with the general economy. 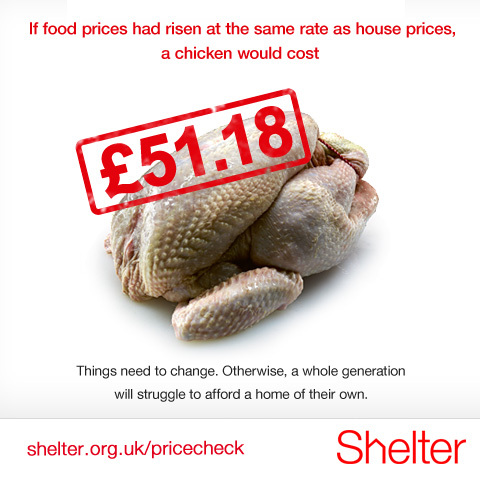 Shelter, a national housing charity recently stated that if a chicken had risen in price at the same rate as houses since the nineteen eighties the cost of one would be about £55. Given that Chickens are still within the range of about £5 to £15 suggests that any retraction we have in house prices so far is negligible and that in real terms houses are still in a huge bubble. So, to sum things up we have banks heavily backstopped by the government, lending to allow first-time-customers to buy overpriced properties and mortgage payers to release equity on these very same over priced properties in order spend into the economy. This apparently, is the secret to ending the great recession even though it all sounds like an ever increasingly complex spirals of debt. They, the LibCons and their cheer leading media whores may like to think that this kind of behaviour is, like a vigorously agitated toilet brush, going clear the blockage, but in reality I fail to see how it helps in the longer term. The simple fact is that as much as we Brits like to kick the crap out of the lazy, feckless Greeks and others it may come as some surprise to this audience that Great Britain has just about the same public debt and exponentially more private debt to deal with. Max Keiser, or one of his guests described the British economy and this particular policy strategy as follows, it’s like a terminally ill cancer patient given morphine. While the effects of the drug are still obvious the doctor declares that the patient is on the road to recovery. Finally, property forms great chunks of the British banks balance sheet. That.is to say that the loan is backed by the house that it bought. The house is the tangible asset. When house prices fall so does value of collateral that the bank can hope to recover should the debtor default. 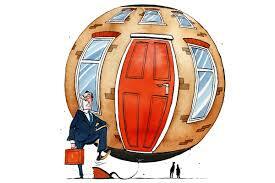 When house prices fall less people are willing to borrow on the perceived value of their houses. Since the economic crash began the UK and most other affected governments have done everything within their power to stem the house price collapse and promote yet more lending. To do this the government have not only sacrificed savers, by instituting the lowest interest rates possible (negative in real terms) but also Nationalised banks and provided vast sums of liquidity. The banks in turn used this money to build up capital reserves and not to lend. So through the Bank of England the government hit back by providing what can only be described as stimulus to get the economic ball rolling. This of course is something that they said would not do given their unfaltering belief in Neo Liberal economics. The simple fact is that the banks were not lending into the economy because in their view the problem had been caused by such lending in the first place and that a good economic argument for doing so did not exist and in that argument the banks were not wrong. The simple and unpalatable argument is that it is a fallacy to think that a healthy economy is dependent on house price inflation. Again, if the price of potatoes were to double, would that induce economic activity? No, it may prompt farmers to turn over land to grow more potatoes and force the population into substituting another staple such as rice or pasta but it would not benefit the overall economy, it would merely distort it. This reminds me of an observation of Stacy Hurbert about a tribe of South Sea Islanders who, during the war, came into contact with American military that set up base. When the military left after the war the Islanders invented what was known as a Cargo Cult that manifested itself in Islanders playing the parts of airfield staff. They cleared parts of the island to make a crude runway and make a tower for one of the tribe to sit with a pair of half coconuts positioned on each ear. Others ran around with bat shaped paddles as they had seen the servicemen do. They thought that if they did this that the cargo planes would return. In some ways this is what our governments are doing by artificially trying to maintain house prices without attending to the rest of the economy. Distorting the economics of house prices is just as flawed thinking as that of the islanders. Our governments are using vast resources to maintain what is in reality a superficial economic effect. This is an effect of what I consider to have been an already a very flawed system at the best of times. It will provide nothing but a cosmetic makeover that sooner or later will be seen for what it is, a way to fool a few people for a few more years. Stimulating growth through stimulating lending is a disaster, even by their own warped and antisocial economic perspectives. God Help Us All! Daily Express: Property Prices To Rise By 4.4%. This entry was posted in Banking, Economics, Finance, Housing, Opinion, Topical News and tagged Age of austerity, bankers, Banking, banking crisis, Britain austerity, House price inflation, Housing Boom, Max Keiser by adminthinkleft. Bookmark the permalink. I suspect they’re just trying to reinflate mortgage values in the hope of making the major banks, all of whom, referring to Max Keiser again, are zombies, carrying a great number of bad mortgages on their balance sheets, solvent again, at least in theory. If you see Osborne’s strategy here as being centred around the well-being of banks and banking then it can start to make sense. You or I won’t be offering Osborne a seat on the board or a consultancy in his life after politics, but no doubt the banks will, witness Blair, Mandelson etc. as recent examples. Perhaps that explains his concern and his actions. Governments underwriting mortgages is a desperately dangerous concept and I am astounded that Treasury officials, never mind the Bank of England, did not warn of the immense risks if things get (more than already) difficult. When the IMF says it’s unwise, for once Osborne should take notice.